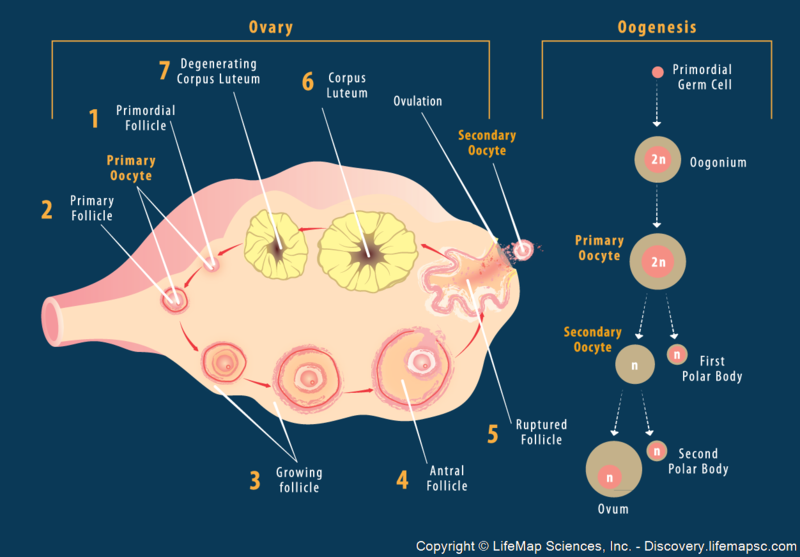 Schematic presentation of the main stages of folliculogenesis in the mammalian ovary. Left: Sequential formation of the primordial follicle (D1–2 postnatal in mice, in utero in humans), primary follicle, antral follicle (prenatally in humans, postnatally in mice) and ovulation, which leaves a ruptured follicle that turns into corpus luteum and eventually degenerates. Right: Oogenesis, oocyte maturation inside the ovarian follicles. Germ cells in the ovary differentiate into oogonia, which divide by mitosis, and mature into primary oocytes, enclosed in follicles. At puberty, periodic secretion of FSH triggers meiosis in a number of primary oocytes, but only one completes meiosis I, producing a polar body and a secondary oocyte. Meiosis II is completed after fertilization of the ovum by a sperm, producing a second polar body.